(AP) -- The rampant growth of urban slums around the world and weather extremes linked to climate change have sharply increased the risks from "megadisasters" such as devastating floods and cyclones, a U.N. report said Sunday. The study - which examines natural disaster trends and strategies to reduce potential catastrophes - also noted that millions of people in rural areas are at higher risk from disasters such as landslides where forests have been stripped away or crippling droughts blamed on shifting rainfall patterns. Much of nearly 200-page report restates warnings from previous studies about unchecked urban growth and shortsighted rural planning. But it also seeks to sharpen the apparent link between climate change and the severity and frequency of major natural disasters including severe droughts and epic storms. "Climate change magnifies the interactions between disaster risk and poverty. On the one hand, it magnifies weather-related and climatic hazards. On the other hand, it will decrease the resilience of many poor households and communities to absorb the impact and recover," said the report, which was released in the Gulf nation of Bahrain. One model predicted many of the more than 19 million people in greater Manila would be swamped by a tsunami hitting the capital of the Philippines. "Asia was hit especially hard," said U.N. Secretary-General Ban Ki-moon, who was in Bahrain for the release of the report. He said more than 300 natural disasters around the world last year caused more than $180 billion in damage. "The linkages between disaster risk, poverty and climate change ... form a particularly tightly interlocked group of global challenges," the report said. 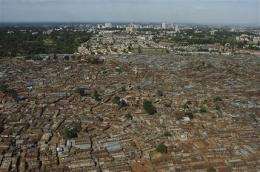 The lead author, Andrew Maskrey, acknowledged it was impossible to halt the migration to cities by people seeking work. "But there are ways to alleviate the conditions of intense poverty if leaders choose to take the steps," he said. "It's all about whether there is the political will." Maskrey noted initiatives in several cities, including Bogota, Columbia, and Karachi, Pakistan, to try to improve conditions in squatter settlements and shantytowns. "There are all these factors coming together: urban poverty, climate change, migration to cities from rural areas," he said. "We're saying: This is bringing about a situation of impending catastrophes, but there's also something we can do about it to lower the risks."